A black and white imagoes the Maidens, jagged granite peaks in the Arrigetch Peaks of Gates of the Arctic National Park and Preserve, Alaska. Please click on the image above to view a larger version of the photo. Here’s an image from the Arrigetch Peaks, in Alaska’s far north, the Gates of the Arctic National Park and Preserve. It’s quite a hike up to the area, but the area is a stunning locale for photography. And climbing. It may well be one of the most popular climbing areas in the state not road-accessible. The main hiking in Arrigetch Peaks consists of 3 drainages in the upper alpine area, The Maidens, Aquarius, and the Arrigetch Creek drainage, home to peaks with cool quirky names, like Ariel, Xanadu and Caliban. This one I converted to black and white. I liked the play of shadow and light on the mountains. Black and white photography is, generally, a more challenging genre I feel, and one I wish I were better at. It’s fun playing with tones and contrast on the computer sometimes, though I admit photoshopping is not one of my favorite pastimes. But with black and white images, the creative element seems a little more playful to me than it does with color photography. I hope to get back up to Arrigetch Peaks this coming summer and spend some more time here. Fascinating place. Anyone wanna come? 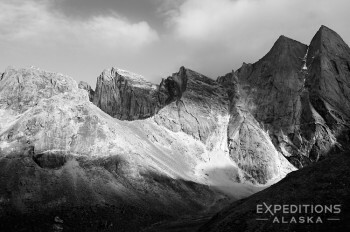 This entry was posted in Alaska, Backpacking and Hiking, Gates of the Arctic National Park, Landscapes, Photography and tagged black and white photos, Gates of the Arctic National Park on February 10, 2015 by Carl D.
A backpacker walking in the Aquarius Valley, Gates of the Arctic National Park, Alaska. Few of the visitors here ever get this far back up in the valley; it’s a bit of a mission to get way back here. For a larger version of the photo, please click on the photo above. Looking over a few old Image folders on my hard drive I found this photo (among others) that I hadn’t yet processed. This one I took on a hike in Gates of the Arctic National Park. We backpacked up into the subalpine area with 5 people, and did a combination of basecamping/dayhiking and backpacking. It’s rugged, steep country, and can be challenging underfoot. This dayhike, we started out with myself plus 4 people, and by mid-afternoon were down to just myself and one other; Jodee V, who’ll walk just about anywhere! The rest of the group had stopped along the day, each person reaching their own threshold of how many rocks they wanted to walk over. This entry was posted in Adventures, Alaska, Backpacking and Hiking, Gates of the Arctic National Park, Landscapes and tagged Arrigetch Peaks, Gates of the Arctic National Park, hiking on November 5, 2012 by Carl D.
Fall colors along Arrigetch Creek in Gates of the Arctic National Park, Sunrise over the Brooks Mountains, Alaska. Please click on the image above to view a larger version of this photo. Here’s an image I took in August on a trip to the Arrigetch Peaks, in Alaska’s Gates of the Arctic National Park and Preserve. 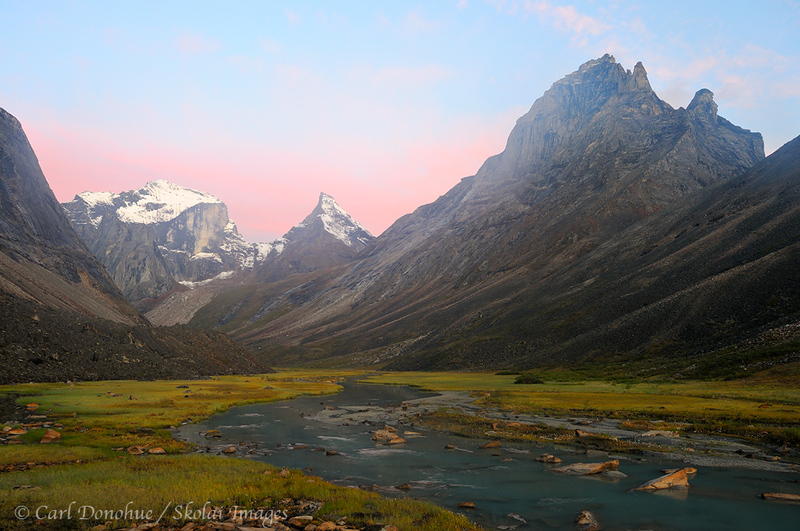 We’d had a great early morning hike up in to and around the Maidens Valley for sunrise, and I shot a few nice images of the peaks catching early light. Afterward we hiked back to camp to catch an hour or so of sleep before breakfast, but I took a few shots along the creek before my nap. I really liked the warm light striking the top of this ridge above camp, but didn’t have long to find a complimentary foreground before the low-lying clouds blocked the light. A pretty good rule of thumb for any landscape photographer in the backcountry is to always camp by water; one can USUALLY find some kind of foreground with a water source, be it a pond, a stream, a lake, the ocean, a glacier, etc. 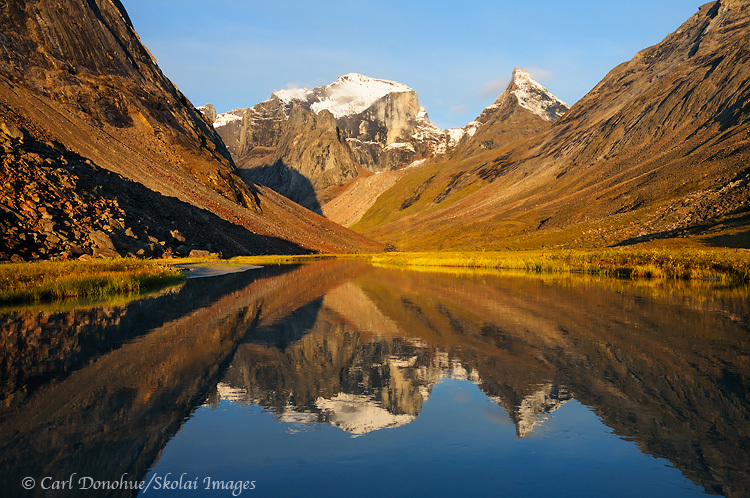 This entry was posted in Adventures, Alaska, Backpacking and Hiking, Fall, Gates of the Arctic National Park, Landscapes and tagged Arrigetch creek, Arrigetch Peaks, Gates of the Arctic National Park, Landscapes, scenics on October 3, 2011 by Carl D.
Arrigetch Creek and reflection of the Arrigetch Peaks, Albatross, Xanadu, and Ariel. Early morning light, just after sunrise, fall, Gates of the Arctic National Park and Preserve, Alaska. Please click on the image above to view a larger version of this photo. 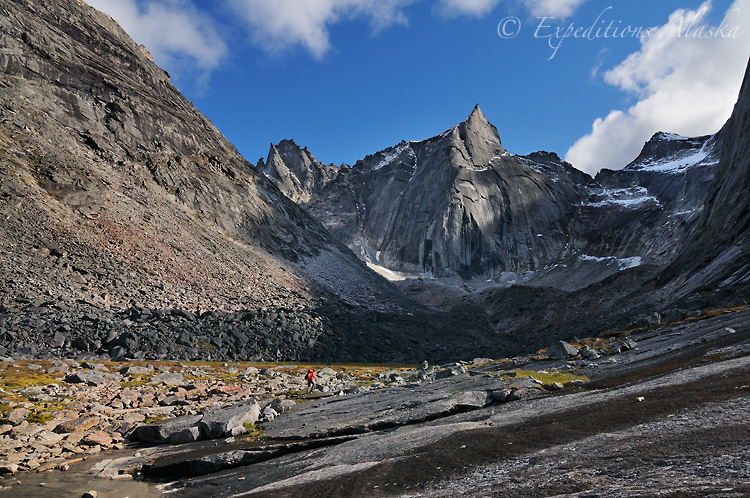 Here’s another from the Arrigetch Peaks trip we did last month, August. This was our first morning up in the valley; really a treat to wake up to something like this. 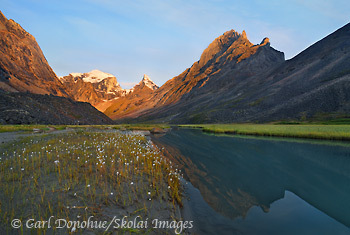 Of course, waking up at 4:30am isn’t such a treat, but such is the life of photography in the Arctic summer. The 3 peaks in this frame are Xanadu, the largest in the background, with Albatross in front of it, and Ariel on the right hand side of the frame. Going out of the frame to the right is Caliban. A mile or so up the creek from here we saw a, wait for it .. a beaver. That was pretty wild, I never thought they’d be up in rock climbing territory. Animals are just full of surprises. This entry was posted in Adventures, Alaska, Backpacking and Hiking, Fall, Gates of the Arctic National Park, Landscapes and tagged Ariel, Arrigetch creek, Arrigetch Peaks, Caliban, Gates of the Arctic National Park, Landscapes, scenics, Xanadu on September 7, 2011 by Carl D.
Hiking in the Valley of the Maidens, Arrigetch Peaks, Gates of the Arctic National Park and Preserve, Alaska. Please click on the image above to view a larger version of this photo. So here’s another self-portrait. 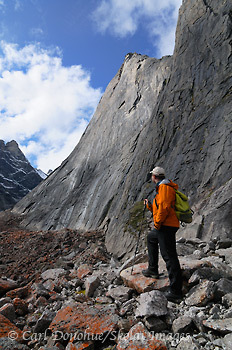 Me on a dayhike up into the Maidens, in the Arrigetch Peaks, Gates of the Arctic National Park. The talus and moraine in the area was pretty intimidating for most folks on the even trip, even though they’re all strong, experienced hikers. walking over endless fields of boulders and rocks is wearisome. 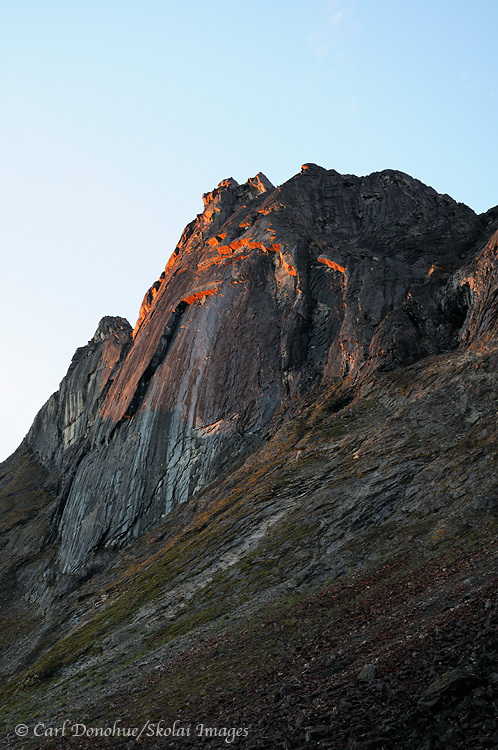 but being so close to such amazing granite outcrops as the Arrigetch Peaks is so worth the effort. The peak to my right is, I believe, “Parabola”. The small pack I’m carrying is a Marmot Komperdell pack, a great little summit pack I take on my most backpacking trips; saves carrying my heavier Mystery Ranch G5000 when I go out for the afternoon; and it looks FABULOUS! This entry was posted in Adventures, Backpacking and Hiking and tagged Arrigetch Peaks, backpacking, Gates of the Arctic National Park, hiking on August 31, 2011 by Carl D.
Caliban, Arrigetch Peaks, Gates of the Arctic National Park, Alaska. Please click on the image above to view a larger version of this photo. Here’s a quick shot of Caliban, from the Arrigetch Peaks. Interestingly, I shot this image just minutes after I dropped my 18-70mm lens into a small pond and totally destroyed it; the lens still have grit and glacial silt inside it from the Arrigetch Peaks; I know the NPS have a rule about “take only pictures”, but I figured if my lens was busted, and I couldn’t really take pictures any more, it might be OK to take some glacial silt with me. 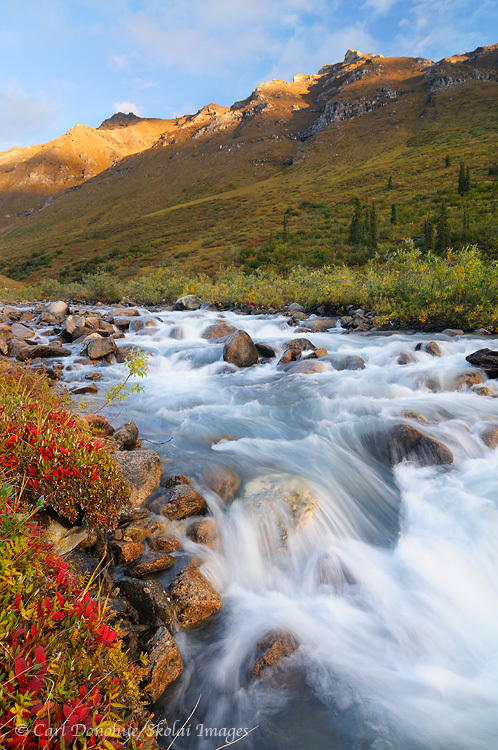 Gates of the Arctic National Park hiking trips. 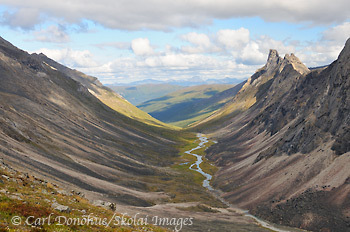 This entry was posted in Adventures, Alaska, Backpacking and Hiking, Canada, Gates of the Arctic National Park, Landscapes and tagged Arrigetch Peaks, Caliban, Gates of the Arctic National Park, Landscapes, scenics on August 28, 2011 by Carl D.
View down Arrigetch Creek, from near Escape Pass, and the peak called Albatross. Elephant’s Tooth visible in the distance. 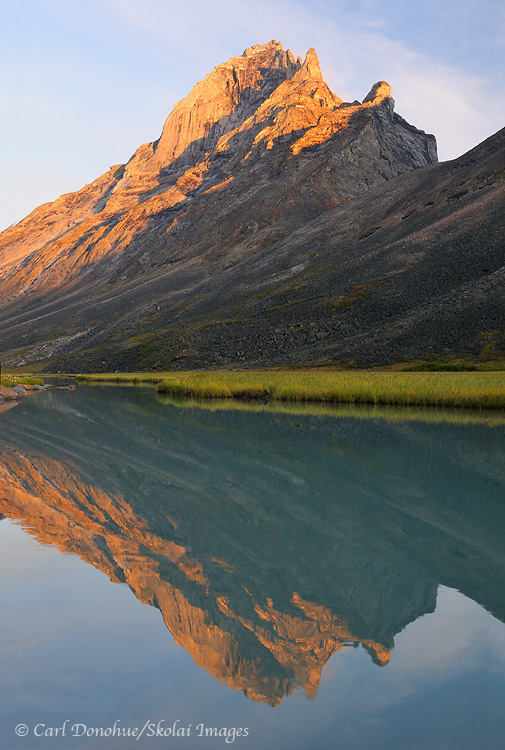 Arrigetch Peaks, Gates of the Arctic National Park and Preserve, Alaska. Please click on the image above to view a larger version of this photo. We hiked up this valley, climbed up high and had supper on a small plateau above the valley. A really great spot to camp. The next morning we ate breakfast and packed up, heading higher still to cross thru a high narrow pass towards another drainage, but we were thwarted by a nasty storm and precipitous granite; in the stormy weather I had neither the time nor inclination to scrap around and find a safe route across the steep traverse on the other side, and we descended to the valley floor after lunch. Sometimes safety means turning back. But what a place to turn back toward, eh? This entry was posted in Adventures, Alaska, Backpacking and Hiking, Gates of the Arctic National Park, Landscapes and tagged Arrigetch Peaks, Gates of the Arctic National Park, Landscapes, scenics on August 25, 2011 by Carl D.
This entry was posted in Adventures, Alaska, Backpacking and Hiking, Gates of the Arctic National Park, Landscapes, Photos Only and tagged Arrigetch Peaks, Gates of the Arctic National Park, Landscapes, scenics, Sunsets & Sunrises on August 21, 2011 by Carl D.